Originating from the Greek word, “joy of the mountain,” this Mediterranean herb is an essential ingredient in dishes throughout southern Europe. 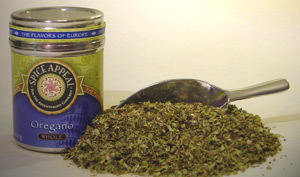 Also known as the “pizza herb,” this herbaceous, slightly floral and bitter flavor is most commonly used in Italian meat stews, lamb and pork roasts, veal dishes, soups, and pasta sauce blends. Delicious in Greek salads, chicken and seafood dishes.